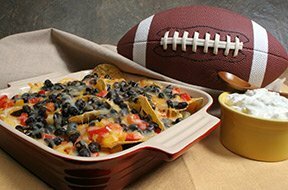 This nacho recipe is perfect for your Super Bowl football party or any special celebration with friends and family. This casserole-like method of preparing nachos is so easy to do and so delicious. Top it with a jalapeno sour cream mixture for a terrific blend of Southwestern flavors. See how easy it is to create an edible bread bowl for serving any of your favorite dips at your Super Bowl party. Use our step-by-step instructions on how to cook tasty barbecue chicken drummies in a slow cooker.